Tag Archives for " Mitch Russo "
It’s never been easier to build a business without an office, without or without a full-time staff and stocked with the best talent from around the world. The online world, coupled with software and services made for virtual collaboration, communication, and management, have made the virtual organization a real and viable business model. To some extent most every company uses virtual tools today for project management, client meetings, HR functions and 3rd party collaboration. Now, smart business owners are setting up businesses with the intention of running virtually from end to end from anywhere an Intenet connection can be had. My guest for this week’s episode of the Duct Tape Marketing podcast is Mitch Russo, consultant, former CEO of Tony Robbins/Chet Holmes Co. and author of the new book The Invisible Organization: How Ingenious CEOs are Creating Thriving, Virtual Companies. We discuss his new book and his experiences in his many business ventures. 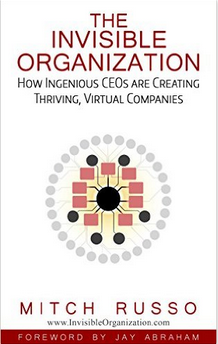 In Russo’s book, you’ll learn just how to create a virtual organization or at the very least run a more nimble business from where you are today. · Why must business owners stay nimble in expanding their business and eliminating overhead? · Who should consider an invisible organization? Employees? CEOs? Customers? · What kinds of tools do you use to track your employees’ productivity in an invisible organization?